Transparency Market Research (TMR) has published a new report titled, “Blood Transfusion Diagnostics Market - Global Industry Analysis, Size, Share, Growth, Trends, and Forecast, 2017–2025”. According to the report, the global blood transfusion diagnostics market was valued at US$ 3.0 Bn in 2016 and is projected to expand at a CAGR of 5.9% from 2017 to 2025. North America is expected to dominate the global market due to increase in adoption of new and advanced molecular tests and rise in prevalence of chronic diseases. Emerging markets such as China and India are likely to drive growth in Asia Pacific. The blood transfusion diagnostics market in the region is expected to expand at a CAGR of over 7.1% from 2017 to 2025. Demand for transfusion of blood and blood components is high across the world owing to large patient population undergoing surgical procedures and suffering from chronic diseases. Introduction of new technologically advanced products and shift toward automation of instruments is projected to propel the global blood transfusion diagnostics market. For instance, the introduction of nucleic acid amplification test (NAT) for molecular disease screening and blood typing has led to improved efficiency and reduced turnaround time. This has increased adoption of automated instruments by blood banks and hospitals, which in turn augments the global blood transfusion diagnostics market. Organizations such as the World Health Organization (WHO), the European Blood Alliance (EBA), and Agência Nacional de Vigilância Sanitária (ANVISA) have been engaged in programs for blood transfusion safety. These initiatives are expected to strengthen the prerequisite requirements for blood screening including donor disease screening. In December 2015, Germany announced US$ 10.8 Mn for implementation and efficient adoption of its Safe Blood Transfusion Programme (SBTP). The kits & reagents segment dominated the global blood transfusion diagnostics market in terms of revenue in 2016. The segment is anticipated to expand at a CAGR of 6.0% during the forecast period. Factors such as rise in awareness and emphasis on blood transfusion diagnostics, especially in emerging countries owing to increase in incidence of transfusion-transmitted diseases such as hepatitis C and HIV are the key factors driving the kits & reagents segment. Players operating in the global blood transfusion diagnostics market focus on introduction of new instruments and kits & reagents based on new techniques. Blood transfusion diagnostics are highly used for disease screening. Rise in incidence of transfusion transmitted infections (TTIs), especially in lower-middle income and low-income countries, is the key factor augmenting the disease screening segment. In terms of end-user, the global blood transfusion diagnostics market has been classified into hospitals, blood banks, diagnostic laboratories, plasma fractionation companies, and others. The blood banks segment held major market share in 2016. It is projected to be the fastest growing segment, expanding at a CAGR of 6.0% during the forecast period. Increase in number of blood banks and blood centers globally, and moderate rise in the number of blood donations each year requiring donor testing and disease screening tests are the key factors driving the blood banks segment. Rise in number of patients being treated in hospital settings requiring blood transfusion and increase in patient testing and blood grouping tests being performed at hospital settings are the key factors propelling the hospitals segment. In terms of revenue, North America was the leading market for blood transfusion diagnostics in 2016. High percentage of active and voluntary blood donors in the U.S. and Canada, increase in number of blood transfusions per year, and various blood transfusion policies being implemented regarding safety and testing of blood for infectious diseases are attributed to North America’s high market share. The U.S. has strong policies for blood screening and the highest rate of adoption of NAT testing for donor disease screening. Europe is the second largest market for blood transfusion diagnostics. Rise in demand for kits & reagents for pre-transfusion diagnostics and domestic manufacturers introducing new kits & reagents for disease screening and blood grouping applications are likely to accelerate the growth of the market in Europe. 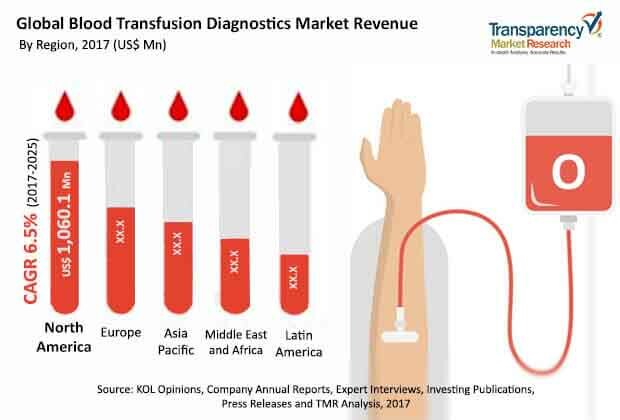 Increase in government initiatives in terms of funding and grants, rise in prevalence of TTIs in these countries, and surge in number of blood transfusions performed every year fuel the growth of the blood transfusion diagnostics market in Asia Pacific. The market in Middle East & Africa was valued at US$ 350.0 Mn in 2016 and is likely to expand at a CAGR of 5.5% from 2017 to 2025. Manufacturers operating in the blood transfusion diagnostics market in Latin America are focused on offering kits and reagents that are compatible with different instruments. The low-cost high-volume nature of kits and reagents is likely to fuel the market in the region. The report also provide profiles of leading players operating in the global blood transfusion diagnostics market. These include Bio-Rad Laboratories, Inc., Grifols S.A., Ortho Clinical Diagnostics, Abbott, F. Hoffman-La Roche Ltd., Immucor, Inc., Quotient Limited, BAG Healthcare GmBH, DiaSorin S.p.A., and Hologic, Inc. Expansion of geographical presence and partnerships for development of innovative solutions are the key strategies adopted by the key players. In June 2017, Immucor, Inc. announced a 10-year automation agreement with CoLabs Laboratory Medicine Network to drive innovations through reagents, scalable automation, and data management solutions.